When friends visit your expat home, you turn into a de facto tour guide. It’s one of my favorite parts of being a serial expat – I get to continuously learn about new places and then to share that insight with some of my favorite people. We’ve only been living in Malta for a few months, but already we’ve had a few visitors! It helps that our friends and families are also the types of people who love to travel and to live in other places. The first visitors we’ve had were friends of mine from the U.S. who now live overseas. One lives in Israel right now and the other has been living in London for three years. Both of these dear friends hold pieces of my past – pieces of who I was years ago that a new friend wouldn’t recognize. That’s the beauty of friendships that span time and space. They are those rare people who delight in who you were, but who also acknowledge, admire, and adore the person you are now. When friends visit your expat home, you show off all the best pieces of it. But, you also share with a trusted friend the low points that exist. Because – trust me – everywhere on Earth has low points! Nowhere is perfect. The goal is to simply find a place that offers more positives than negatives; the goal is to live in a place that offers you what you want without taking away too much. So when friends visited us here in Malta, we showed them the good, the bad, and the gorgeous. We wandered the capital city of Valletta on foot. We marveled at the beauty of the Grand Harbour from the Upper Barrakka Gardens. We drank cocktails, and wine, and beer, and prosecco. We ate local food and we cooked at home. We took a boat trip and we watched the sunset over the sea. There was scuba diving and there were manual car driving lessons. There was laughter and there were hugs. When friends visit your new expat home, you get to see its beauty all over again. There are pieces of that new place that now seem normal to you that your friends will point out in wonder. You will, once again, see everything through the eyes of a stranger to this land. You will also explain that the driving here is beyond insane, that there is trash everywhere because pollution is a serious problem here, and that the sweating does not, in fact, ever stop. Maltese apartments tend not to have air conditioning or heat, despite the fact that both are quite necessary for the climate. You will explain that there are stray cats everywhere, but that many people feed them. So those specific plastic containers should actually stay where they are because they’re not trash. And you will also explain that the sea is a playground, that the sun is unfathomably strong, and that smiles are a daily outfit. When friends visit your expat home, you will explain everything from your unique perspective as a local resident of a foreign land. You can compare these places more easily…sometimes too easily. It is refreshing to the soul to have old friends visit you as an expat. There’s something magical about bringing people from a previous life into your new life. Showing them around your new neighborhood and introducing them to your new friends intertwines pieces of you so that you feel more complete. It can be hard to separate your life into sections. Certain people know other people, but they don’t know your new people. Certain people are familiar with certain places, but they’ve never been to your other places. Your stories have to be explained and stopped and explained again. So, eventually, you just stop telling stories to those people who don’t know who or where you’re talking about. 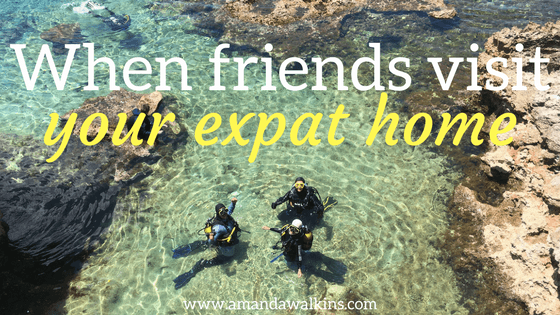 It’s such a beautiful moment to have old friends come to your new expat home, adding a layer to your friendship and a lifeline in your expat life. When you can call those friends with a story about so-and-so or about such-and-such a place, they know who you mean and what you’re referencing. But they know all these things at a glimpse – they don’t share the same level of insight as a new local friend. That means they can also offer advice or opinions with no investment in the issue at hand, other than your own well-being. Your local friends will see things through their own lenses and experiences, which can be incredibly beneficial in learning about your new expat home! But it can also be a hindrance when you want another point of view to chime in on an issue. Those old friends know your many layers and levels, and now they vaguely know your new life, too. Their ability to offer informed opinions increases multi-fold after visiting your new expat home. It’s a massive help to have people outside of your immediate vicinity listen to your questions and offer an outside perspective. When friends visit your expat home, you’re offered a reprieve from constantly trying to fit in and to find new places and to learn new things. Instead, you’re able to flip the coin and share what you do know. You can finally talk like an expert and answer questions instead of always asking them. When your friends come to visit your new expat home, you feel rejuvenated and proud of what you’ve accomplished in your new life, rather than always seeing how much more there is to learn and do. You can celebrate these small victories with someone who shares other moments and memories with you – other small victories elsewhere in time and space. It’s those friendships that carry through the gaps in years and physical locations that end up carrying us through every obstacle. We should celebrate those small victories more often, but having an old friend come to visit your new home is certainly a good excuse to do so! We’ve been expats in multiple countries, including Honduras, Scotland, and Ireland. For now, we are living on the Mediterranean island of Malta. You can read more about daily life as an expat in Malta here. You can follow our expat adventures by subscribing to my newsletter below, and connect with me on social media, too! I’m on Facebook, Instagram, Twitter, and Pinterest.